Poppies is a leading UK manufacturer and supplier of high quality bespoke printed napkins. TWM asked partner and technical director Armindo Marques how he plans to meet the challenges and uncertainties of the pre- and post-Brexit market. • and the pressure on the manufacturers to always find synergies and efficiencies in order to remain competitive. Since the vote for Brexit, as a manufacturer the impact we have felt has been immediate. We have seen a collapse of pound sterling, which has had a direct impact on the cost of raw materials increasing it by 14%. As the UK is the biggest importer of tissue paper in Europe with purchases done in Euro and US dollars our industry has been severely impacted. • and adapt our purchasing strategies. We had to work very hard to minimise the price increases for our customers. Although tissue products are mainly volume commodity items with low margins that can’t absorb high transport costs, the UK has always seen a constant flow of imports coming from other European countries where integrated manufacturers have the industrial need to shift some volumes at very low margins in order not to disturb their internal markets. This phenomenon has dramatically slowed down after the vote, as I suspect those imports ran into negative margins and Poppies did not miss this opportunity. We have invested in an extra three new production lines to support our double digit organic growth. The biggest challenge for the tissue AfH market is its segmentation: from delivering one mixed pallet with 20 product references to small independent wholesalers as against truck load deliveries of a single product line to large international corporate distributors. To achieve this and offer the best service we have invested in a robust ERP system (SAP) backed up by 34 high performance production lines along with a very well trained and motivated work force. The next opportunity for us is to expand our presence in the retail market. The prospect of Brexit has opened a lot of the retailers’ doors especially for napkins where they now favour domestic suppliers. Export is also an opportunity: our own natural export market is Ireland where our “Poppies” brand has become very popular with its core values … “Professional, Trustworthy and Dynamic” are really appreciated by the customers. As our industry is directly linked to the economic condition, if people struggle they don’t go out as much and therefore don’t consume disposables products. Before Brexit the napkin market had been steady in volumes while growing in value due to a clear trend for better quality (3-ply tissue and airlaid) and more personalised products. We recognised that trend and invested over £5m in the last four years to produce high quality bespoke printed napkins. We are now the UK expert. From our perspective as the Brexit process progresses, the economic outlook for the coming years is very uncertain. 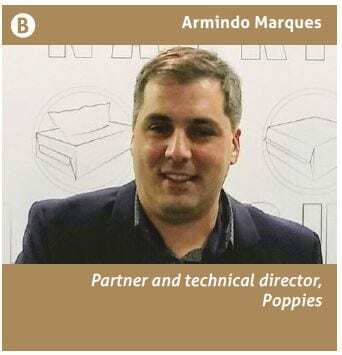 But at Poppies we strongly believe that the napkin market will hold for the next couple of years and following the Brexit conclusion in 2019 will carry on growing at a steady pace in to the next decade. In the medium term we will keep investing in new production lines, napkins and hygiene to keep up with the demand and remain competitive. This year we will purchase three Omet napkin lines with printing, one Servotec-supplied napkin line hight quality print and three wrapping machine from Multipack. The new technological jump for us will be the digital printed napkin lines that offer a photo quality print on tissue. There are three main players on the market and we are currently assessing their propositions. As we did in our recent past we will be actively looking for potential synergies with other competitors. Takeovers are clearly part of our growth strategy. If we fast forward and look into the long term, our ambition is to have an integrated operation and start producing our own tissue paper. Share the post "As Brexit looms UK domestic tissue suppliers see their chance"